Overwatch, the new shooter game from Blizzard, has already dazzled us not with its actual gameplay, but with its lavish announcement trailer that had us excited for an animated series about these kooky scientists and heroes saving the day. But we’ll take the next best thing: a bunch of comic books! 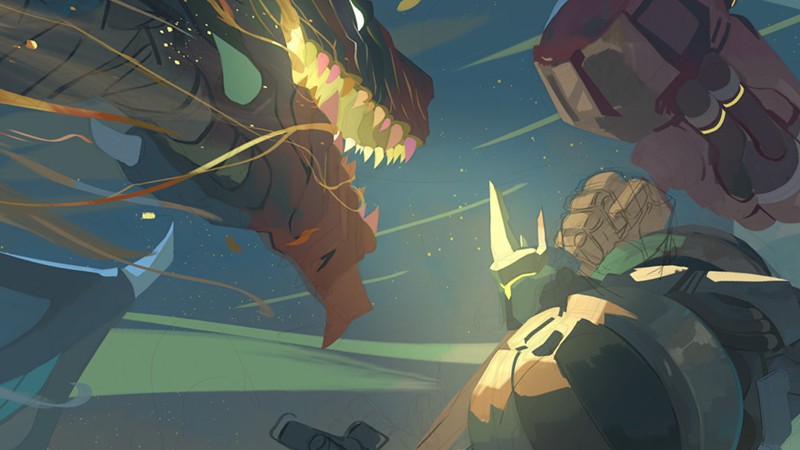 Okay, so the good news is that we’re also getting a bunch of animated shorts set in Overwatch’s universe—a near future world ripped apart by war that lead to the formation of the Overwatch group, made up of researchers, soldiers, and scientists/ There are also apparently giant hammer-wielding robot knight guys fighting dragons, if the above art is any indication. But, more pertinently for sci-fi fans who don’t want to have to play a game to see all this stuff, Blizzard will heavily lean into comics set in the Overwatch universe to provide story elements and character backgrounds for the game. All the lore, with none of the stress of a competitive shooter! Blizzard had already announced a graphic novel set in Overwatch’s world at San Diego Comic-Con earlier this year, but at Blizzcon this weekend, the company announced even more digital comics will come ahead of the game’s release. No details on writers or artists for the one-off stories were announced, but it’s cool to see such a visually interesting looking series spinning off into other mediums like this. After all that amazing Overwatch cosplay we saw at Blizzcon, we’re dying to get a bit more of this universe beyond the game itself.